The December batch of legendary upgrades has been released. Any chance from idk 23th dec to the 5th next year could all upgrades be available and maybe at a discount? Any chance to get the Imperial-Red upgrade? (06-12-2018, 08:11 AM)Woody Wrote: Any chance from idk 23th dec to the 5th next year could all upgrades be available and maybe at a discount? (29-01-2018, 04:34 AM)Winter Wrote: Next, a new item tier has been added - Awakened Legendary items... These items are not meant for everyone to be able to obtain, nor are they something people are supposed to amass. 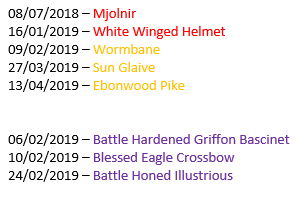 They are for the few people that want to upgrade specific legendary items they have grown attached to. By that logic, you would be agent most of the times they have to change the crafting cost? I'm talking about 10-20% so less of an impact than some most? or all? updates have been. I can't remember if it was 2 or 3 or 4 years ago at this rate my guess is 3. Did we get 20hm on Xmas and 50 if your account active? idk I can't remember the details but my point is that it would be not much different from getting a free gift in your inventory. Well other than the fact all active people benefit from that but then it just leaves there inventory into someone else's. Then there no reason why you can't stop there and make all crafting cheaper for (x) days. Once again I'm talking small not 50% like some deals you see at your local hardware store. (11-12-2018, 10:59 AM)Woody Wrote: By that logic, you would be agent most of the times they have to change the crafting cost? I'm talking about 10-20% so less of an impact than some most? or all? updates have been. Yes, I was agent (just kidding, _against_, robble robble) the free HM ~4 years ago. Were you expecting me to post "Wow, you're right, I'm a huge hypocrite. What have I done?!" Yes, I was agent (just kidding, _against_, robble robble) the free HM. Were you expecting me to post "Wow, you're right, I'm a huge hypocrite. What have I done?!" Anyway, the value of the free HM is completely dwarfed by even 2% of the cost of a red legendary upgrade, let alone the 10% you propose. This even disregards the fact that the spirit of the upgrades is not to make them all completely accessible to everyone. Inflation. And are you comparing a discount to a free product? One can be linear savings while the other one is just something that you may not even want. (11-12-2018, 01:38 PM)Woody Wrote: Inflation. And are you comparing a discount to a free product? (11-12-2018, 10:59 AM)Woody Wrote: I can't remember if it was 2 or 3 or 4 years ago at this rate my guess is 3. Did we get 20hm on Xmas and 50 if your account active? idk I can't remember the details but my point is that it would be not much different from getting a free gift in your inventory. Well other than the fact all active people benefit from that but then it just leaves there inventory into someone else's.